FANTASTIC BEASTS AND WHERE TO FIND THEM is an all-new adventure returning us to the wizarding world created by J.K. Rowling. Produced in 2016, it is stock #65289. Produced in 2016 is this 2.625″ x 1.875″ metal pewter keychain/keyring that features the ACCIO spell logo (The Summoning Charm) as depicted in the books and seen in the hit movie Fantastic Beasts And Where To Find Them and the Harry Potter movies. 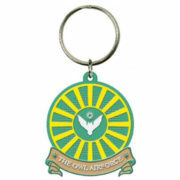 Produced in 2016 is this 2″ x 2.25″ pvc soft touch keychain/keyring that features the air force logo from the hit movie Fantastic Beasts And Where To Find Them. 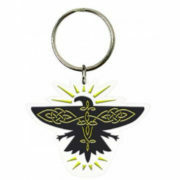 Produced in 2016 is this 2.625″ x 2.125″ pvc soft touch keychain/keyring that features the eagle logo from the hit movie Fantastic Beasts And Where To Find Them. Has your Erumpent escaped? If you plan on catching it you’ll probably need a vial of Erumpent Musk. 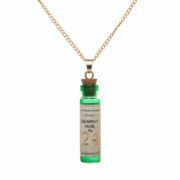 This necklace is all you need make sure you’ll always have one handy if you need it, from the hit movie Fantastic Beasts And Where To Find Them. You won’t learn about these charms in Professor Flitwick’s class. 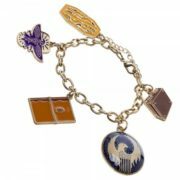 This charm bracelet includes the Thunderbird, Newt Scamander’s magical suitcase, Newt Scamander’s journal, Newt Scamander’s personal logo, and the MACUSA crest from the hit movie Fantastic Beasts And Where To Find Them. 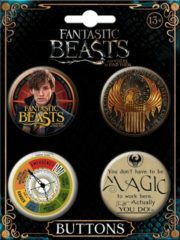 This is set of four 1.25″ wide round buttons that features images from the hit movie Fantastic Beasts And Where To Find Them. They are attached to an illustrated card, are new and unused and are stored in a smoke and pet free environment. 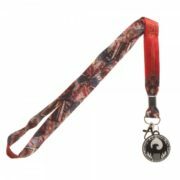 Produced in 2016 this is a double-sided cloth lanyard that features multiple images from the popular book and movie series Fantastic Beasts And Where To Find Them. 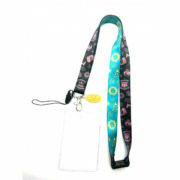 It can be used to hold keys, name tags, membership and business cards and more. It also has a green dangle in the image of the NS logo (Newt Scamander) which also serves as a screen cleaner. 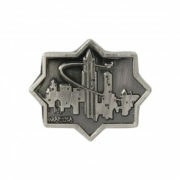 This is a mint, unused pewter metal lapel pin that features the MACUSA city logo from the hit movie Fantastic Beasts And Where To Find Them. 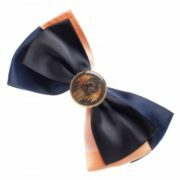 Keep your hair in place without using any spells with this Fantastic Beasts crest bow. The multi-colored ribbons are held together by the MACUSA crest. It is a new, unworn bow produced in 2016 and is stored in a smoke and pet free environment. 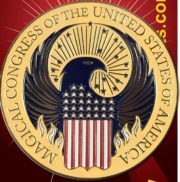 This is a mint large enamel metal lapel pin that features the crest logo of MACUSA (Magical Congress of the United States of America) from the hit movie Fantastic Beasts And Where To Find Them, a prequel to the Harry Potter movies. 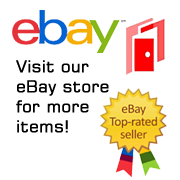 It measures 2″ across, comes in a sealed package with a header card and it is stored in a smoke and pet free environment. 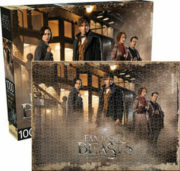 Produced in 2016 this is a double-sided cloth lanyard that features multiple images from the popular book and movie series Fantastic Beasts And Where To Find Them. 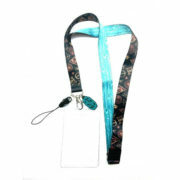 It can be used to hold keys, name tags, membership and business cards and more. 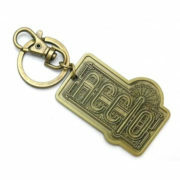 It also has a charm dangle in the image of the MACUSA logo and has a clear id holder that contains a collectible sticker. FANTASTIC BEASTS AND WHERE TO FIND THEM is an all-new adventure returning us to the wizarding world created by J.K. Rowling. FANTASTIC BEASTS AND WHERE TO FIND THEM opens in 1926 as NEWT SCAMANDER has just completed a global excursion to find and document an extraordinary array of magical creatures. Arriving in New York for a brief stopover, he might have come and gone without incident…were it not for a No-Maj (American for Muggle) named Jacob, a misplaced magical case, and the escape of some of Newt’s fantastic beasts, which could spell trouble for both the wizarding and No-Maj worlds. 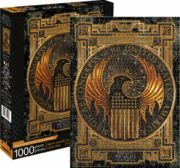 Produced in 2017, it is stock #65315 featuring the MACUSA (Magical Congress of the United States of America) logo. 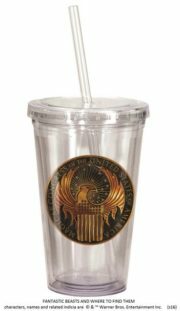 This is an illustrated, 18 ounce, acrylic travel cup that features the logo of MACUSA (Magical Congress of the United States of America) from the hit movie Fantastic Beasts And Where To Find Them, a prequel to the Harry Potter movies. 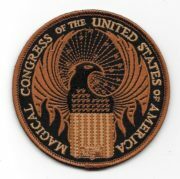 This is a 3.5″ diameter embroidered patch that features the logo of MACUSA (Magical Congress of the United States of America) from the hit movie Fantastic Beasts And Where To Find Them, a prequel to the Harry Potter movies. 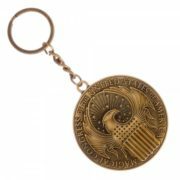 Produced in 2016 is this 2″ diameter metal keychain/keyring that features the logo of MACUSA (Magical Congress of the United States of America) from the hit movie Fantastic Beasts And Where To Find Them. 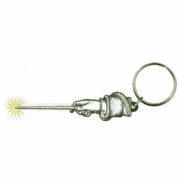 If you don’t happen to have your wand handy this keychain will keep all your No-Maj unlocking tools handy. 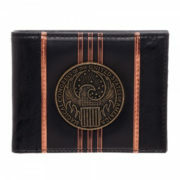 Produced by in 2016, this is a licensed bi-fold dark brown vinyl wallet featuring a 1 7/8″ diameter metal logo of MACUSA (Magical Congress of the United States of America) on the outside as seen in the hit movie Fantastic Beasts And Where To Find Them. 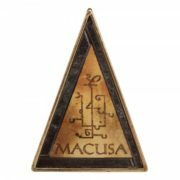 This is a mint, unused metal enamel lapel pin in the image of the MACUSA triangle logo from the hit movie Fantastic Beasts And Where To Find Them. Produced in 2016, it measures 1″ wide by 1.5″ high and it is stored in a smoke and pet free environment. 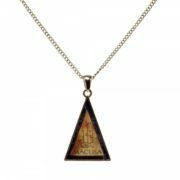 Show off your MACUSA allegiance with this necklace in the image of the MACUSA triangle logo from the hit movie Fantastic Beasts And Where To Find Them. 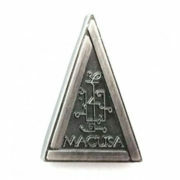 This is a mint, unused pewter metal lapel pin that features the MACUSA triangle logo from the hit movie Fantastic Beasts And Where To Find Them. 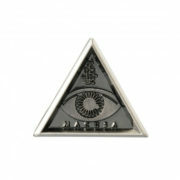 This is a mint, unused pewter metal lapel pin that features the MACUSA wicked eye triangle logo from the hit movie Fantastic Beasts And Where To Find Them. 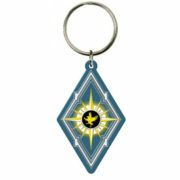 Produced in 2016 is this 2.5″ x 1.5″ pvc soft touch keychain/keyring that features the magic star logo from the hit movie Fantastic Beasts And Where To Find Them. Produced in 2016 is this 3.5″ x .75″ pvc soft touch keychain/keyring that features a magic wand logo from the hit movie Fantastic Beasts And Where To Find Them.